It’s time to see what it takes to put on the largest helicopter show in the world! Each year, the Helicopter Association International (HAI) hosts Heli-Expo, the helicopter industry’s premier rotorcraft show. And what a show it is! The instant visitors step through the door they enter the helicopter world’s equivalent of Emerald City. Flashing lights twinkle from every direction. Elaborate displays showcase shiny new gadgets. Banks of plasma television screens show high-resolution action footage of aircraft. And then there are the helicopters – dozens and dozens of them – from the smallest kit-built models to some of the biggest people movers ever attached to a set of rotorblades. For the helicopter enthusiast, Heli-Expo is the center of the universe. But how does HAI bring it all together? R&W, a regular exhibitor at Heli-Expo, tracked the steps taken to transforms the mere thought of a show into the fun, exciting, educational event that is Heli-Expo. "Right now we’re working on [Heli-Expo] Houston, which is in 2010," said Matt Zucarro, president of HAI. "But at the same time, we’re also working on shows as far out as 2015." Very few convention centers can make it past HAI’s main two qualifiers: landing zones and helicopter access. Of the nearly 500 convention centers in the U.S., only a small fraction of them can accommodate Heli-Expo’s 17,000 attendees, dozens of classrooms and 500-600 exhibitor booths, plus land 60-70 helicopters on-site and fit them through the door of the convention center itself. For example, the convention center in Washington, D.C. has a large facility with doors nearly big enough to fly an aircraft through. But the lack of a suitable landing zone in its downtown location and tightly restricted airspace knocks it squarely off the list. "We’re only looking at places that have one million square feet. 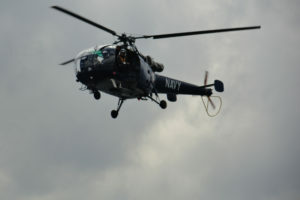 Last year, we had over 65 helicopters that we landed over a 2-day period," said Zucarro. "We [also] do an inspection and decide whether we can, in fact, establish a temporary heliport like we do each year at the show that will support the aircraft and also be able to get them inside the hall." For the venues that survive the first cut, other questions come into play. Can the convention center book HAI on the dates it desires? Are there enough hotels to accommodate the attendees and exhibitors? Is the location convenient to airports that can serve the thousands of international guests who regularly fly in for the show? Are there enough eating establishments nearby? And, of course, what will it cost HAI to rent the building? After taking all of the above into consideration, Heli-Expo is limited to only a handful of cities in the U.S., which for now are Anaheim, Dallas, Houston, Las Vegas and Orlando. Local governments, area theme parks and tour companies frequently offer incentives to help steer the show toward their city, such as discount tickets to attractions for attendees and their families. Once HAI has settled all issues and concerns with the prospective venue, a contract is signed 18 months or more before the anticipated show date. Hotel contracts are also signed around this time to ensure space and attractive room rates for attendees. If incentives are offered by local entities, those are finalized around this time, too. Approximately 18 month before a show opens, HAI begins advertising booth space to exhibitors. A "booth" is a generic, working term that includes everything from a curtained-off space measuring a few square feet to an enormous display area equal to the square footage of a five bedroom house. And just like a piece of land, it’s all about size and location on the exhibit hall floor. Proceeds help pay for the rental of the convention center, activities for attendees, meeting rooms for seminars, and extra cash to help run HAI. "[Heli-Expo] generates the majority of our revenues," said Zucarro. "Those revenues allow us to serve the needs of our members in the international helicopter community throughout the year. We’ve been able to maintain minimal or no increases in membership dues for quite some years by relying on the show for our main source of income." Companies that do business in the helicopter industry have the opportunity to attend several other expos, such the those hosted by the Airborne Law Enforcement Association, the Association of Air Medical Transport Services, the National Business Aviation Association and the all-encompassing Paris Air Show. And since the primary customer base of some of those companies is stronger at some shows than others, companies might rent different size booths for different shows. Since HAI’s Heli-Expo is considered to be the "big dance" in the helicopter world, vendors tend to rent the largest booth they can afford at this event. Once a booth has been rented, the company has wide latitude regarding how they set it up. Most have already gone to a professional display company and had specialized show areas designed just for them. They can range from a simple set of signs to a reusable, two-story structure complete with customer lounges, platforms for displaying aircraft, and even a wet bar for serving cocktails to clients – all built to be easily shipped, assembled inside the exhibit hall, disassembled and shipped home for storage until the next show. Besides the cost of a company’s display, the only real restrictions they have on what they can erect are imposed by the convention center and public safety officials. For example, many venues require exit signs inside of enclosed vendor areas, or restrict the use of pyrotechnic devices in flashy presentations. Most exhibit halls require display aircraft to have their fuel caps taped shut or the tank drained altogether to minimize the risk of fire. Even then, local fire departments usually assign personnel to patrol the exhibit floor throughout the show. Actual booth rental costs are a closely guarded secret at HAI, as well as by other show hosts. Special deals often come into play when negotiating that price, and can be a function of the exhibitor’s financial support of some other aspect of the show (i.e., shuttle buses, tote bags, banquets, etc.) or a commitment to rent space in the future. The possibilities are endless. Two days prior to opening day at Heli-Expo, the convention center’s receiving platform begins to fill up with crates containing the exhibitors’ displays. Rotor & Wing’s booth is shipped from our headquarters in Maryland in two, high-impact, golf club bag-size containers. Inside are two backdrops that can be assembled by one person in about 40 minutes. Posters and the magazines we give away are shipped in separate boxes directly from the printer. Bell Helicopter’s booth, by comparison, is huge, and includes private meeting rooms, a long customer hospitality counter, elevated aircraft display platforms and scale models of their products. Consequently, their booth arrives in crates the size of small automobiles. Even the mock-up of the BA609 tilt rotor they bring is sent piecemeal in wooden containers. Companies like FLIR have specially made displays, too, but have the extra added problem of needing to ship very delicate electronic equipment. For that, they use heavily padded cases made of high-impact material, accompanied by trunks containing the wiring harnesses needed to make everything work. With all of the crates, boxes and trunks arriving at the hall, hauling them inside to their assigned place without a plan would certainly cause gridlock. So, the convention center subcontracts a company that specializes in managing the movement, set-up and individual needs of the exhibitor’s areas. Its people draw up a plan to efficiently move everyone’s gear into the hall, often by bringing in the biggest items first and the smaller items last. But use caution if you happen to be around while they’re filling the hall, because it looks like the deck of an aircraft carrier during launch operations! 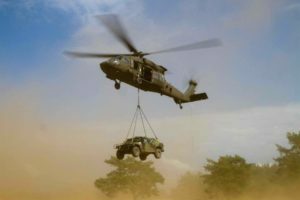 Bringing freight into the exhibition hall for the world’s biggest helicopter show is tricky at best, and can even be dangerous. Electricians in motorized basket lifts are wiring up overhead signs. Assemblers are wrestling massive display walls into place. And at any given time, an unwary pedestrian can step into the path of a forklift with a crate balanced precariously on its prongs. Pedestrians need to have their heads on a swivel if they want to get in and out in one piece. 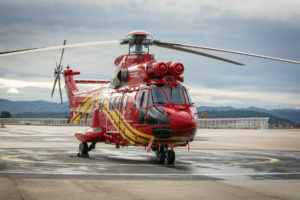 Months before a show, HAI has already scouted the area and developed a small army of local FAA officials and helicopter operators to get the dozens of aircraft into the host city and on the ground at the convention center. "You need to know if they’ve added a building or they’ve moved something into the way since the last visit," said Marilyn McKinnis, HAI’s V.P. of maketing and the person in charge of planning Heli-Expo. "And you have to be thinking about how your freight is going to be coming in at the same time you’re landing helicopters." On each of the two arrival days, HAI’s marshals direct the pilots in for a landing in the convention center’s parking lot, then immediately have their aircraft towed from the landing zone to the roll-up exhibition hall door. This creates a steady stream of aircraft coming in during a window of time designed to reduce their impact on normal air traffic. The sequence of aircraft arrivals are based on where they will be inside of the building, striking a balance between filling the hall from the front to the rear roll-up door, and the ease with which the helicopters can be maneuvered around the labyrinth of support posts, crates, partially assembled display areas and aircraft that got there first. Sometimes, the aircraft’s own mechanics must remove one or more rotor blades in order to get the ship through the door. Small cranes are often hired to help, but good advance work keeps it from being a surprise. A lot of the hustle and bustle in the hall slows down considerably when the helicopters come through the door. Everyone knows that even the biggest and beefiest choppers in the air are extremely delicate on the ground. That’s why several people, usually including the flight crew, "walk the wings" of each helicopter as they are towed and wheeled to their display spots. Once in awhile, clearances between, tails and blades can only be measured in tenths of inches. Once in place, mechanics seal gas caps shut, disconnect starters and take care of other safety items established by the convention center, HAI and local public safety officials. They then start cleaning up the aircraft inside and out, nose to tail. They’ll even wipe the soot out of the exhaust pipes. After all, it’s there to be shown off. By 3:00 P.M. the day before the show, last minute details are being taken care of. Inside the exhibit hall, show management personnel subcontracted by the convention center are hauling empty crates to a storage area out back, laying carpet in the aisles, and delivering furniture, potted plants and display pedestals to vendors who would rather rent them bear the inconvenience and greater expense of bringing them. By this time, the exhibitors who will staff their booths are arriving to arrange their wares. Those from smaller companies with simple booth layouts will use the time to assemble their own display areas. Outside of the hall, signs are being erected on exterior walls, magazine racks are being filled and HAI’s gift shop is being stocked on the concourse. Elsewhere, chartered shuttle buses are having huge Heli-Expo banners attached, affiliated hotels are putting up show schedules, and company executives are arriving at the airport. Out on the convention center’s concourse, attendees are lined up at the registration booth to get their badges, schedules and tote bags. Maybe a local band is playing music. And the gift shop is already doing a brisk business in HAI shirts and hats. But behind the still-closed exhibit hall doors, there’s still a lot of activity. With anywhere from nearly one millions square feet of display area, lots of little things in the exhibition hall are still being seen to as late as 10 minutes before the doors open to the membership. Carpet layers armed with miles of double-sided tape are patrolling the floor in search of upturned edges that could trip an attendee. Forklift drivers are carting off the last few empty shipping boxes. And platoons vacuum cleaner operators are hunting down the last few specks of debris. Personnel from companies with booths have been filtering in since dawn, depending on how much preparation they had leftover from the day before. For those whose areas are set, there are a few minutes left before the doors open to stroll through the hall, visit with other industry friends and check out the other products on display. It’s finally zero hour. Years of preparation have culminated in the opening of Heli-Expo! Instantly, attendees are hit head-on by gleaming aircraft and shiny equipment in nearly every direction. Vendors stand waiting to showoff their latest products, answer questions and pass out the hundreds of business cards they’ll go through before the show closes. In other parts of the convention center, rooms are filling up with attendees who want to learn about new FAA regulations, the latest service news on their model of aircraft, or one of many other subjects presented by experts in the field. Meanwhile, convention center and show management personnel are standing by, ready to pounce on burned out light bulbs, malfunctioning air handlers and overflowing trash bins. But for the attendee, it’s just one, big, enjoyable event! On the morning of the last day of Heli-Expo, show managers deliver a sheet of paper to each vendor. On it is vital information about how to get packed up and out in an orderly fashion at the end of the day, including how to pack and stack gear for shipping. As soon as the doors close behind the last attendee, the sound of forklifts and people shouting instructions commences. Within 20 minutes, the hall is nearly unrecognizable as booths are being dismantled, carpet is being yanked up and shipping crates are being brought in from the dock to be reloaded. Once filled, the exhibitor puts a pre-printed shipping sticker on it and leaves it behind. Dock workers will come through later and get it shipped out. During this time, incredibly intense preflight inspections are being carried out on the aircraft that were on display. That aircraft’s own mechanic, if not one similarly trained, will painstakingly make sure the aircraft is airworthy after days of being boarded and explored by Heli-Expo’s visitors, not to mention a few convention center workers who may have done some unsupervised exploring after hours. The aircraft don’t always leave on the same precise schedule by which they came in, mostly because some need more preflight attention than others. But regardless of when they’re ready to leave the building, they are eased out with the same care used to get them in. Outside, the ballet of departing helicopters is a show in its own right for attendees, exhibitors and passing residents who gather to watch 60 helicopters takeoff and head back home. With hundreds of cameras clicking away, helicopters depart one-by-one under the control of the marshals who directed them in several days before. Air traffic controllers, alerted to the massive exodus ahead of time, pass the aircraft out of the area in turn until the last one has disappeared into the distance. By the following Monday, HAI’s staff has all but forgotten the show. After all, there are only 361 days left before the next one.